Recent data confirms suspicions about winter in the northern hemisphere, that it was very cold. Which is interesting as we had a particularly nice summer, though our winter 6 months or so ago was colder than usual. Not only did the world fail to continue warming after 1998, there has been a precipitous drop in the last year. The scale on the left says temperature, but I think it means difference in temperature (from some predefined point). The global temperature is about 15°C. 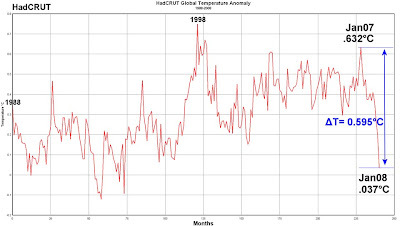 I am somewhat suspicious of global temperatures. Some stations are not ideally set up and there is a lot of data points unknown (like most of the Pacific Ocean). Satellite data is better but it is of shorter duration and represents non-surface temperatures. Academically I find this pleasing. Of course I don't want a cooler earth, I want a warmer one, and I think that the complete loss of the northern polar cap would be beneficial allowing warmer seas in that area and possibly warmer winters in the northern hemisphere (but possibly cooler summers also). It is pleasing because it may lead to increased suspicion about the anthropomorphic global warming theory. I am aware that one cold summer does not discredit the theory—of course there are plenty of reasons pre-dating this summer that discredit it—general warming trends can theoretically have cooler spells. But the significant change may cause people to have second thoughts. And even if it doesn't change people's minds, giving them reason for increased doubt and an awareness that the data is not so certain is a good thing. As beneficial as a warmer earth would be, it is not worth the political evil that is being enacted. So if we need to put up with a cooler earth until the naysayers have their theories cremated, so be it. Then we can hope for a sun cycle that gives us ice-free Arctic Sea and the benefits of more equitable climate. Ham was the youngest son of Noah. Sons of Ham(1): Cush(2), Seba(3), Havilah(3), Sabtah(3), Raamah(3), Sheba(4), Dedan(4), Sabteca(3), Mizraim(2), Ludim(3), Anamim(3), Lehabim(3), Naphtuhim(3), Pathrusim(3), Casluhim(3), Philistines(4), Caphtorim(3), Put(2), Canaan(2), Sidon(3), Heth(3), Jebusites(3), Amorites(3), Girgashites(3), Hivites(3), Arkites(3), Sinites(3), Arvadites(3), Zemarites(3), Hamathites(3). In the Septuagint the word Cushite is translated Ethiopian, however the region is likely to be more closely aligned to Sudan; essentially south of Aswan in Egypt. Seba was the ancestor of the Sabeans who dwelt in south Arabia. The name Havilah appears twice in the Table of Nations, the other is a Semitic tribe. The same name occurring in genealogical tables (in general) may suggest that descendants of both men lived in a similar area and possibly intermarried to become a single tribe. Bill Cooper thinks that in the case of Havilah however there were 2 distinct tribes living in different regions of Arabia. Sabtah was the ancestor of the Hadhramaut people in southern Arabia. Raamah's descendants were probably another Arabian tribe. The nation of Sheba existed in southern Arabia in the area of Yemen. Though some claim this is the kingdom from whence came the queen of Sheba, a better case can be made for Queen (of) Sheba being an Egyptian. Dedan dwelt in west Arabia. Interestingly Abraham several years later had a son called Jokshan by his wife Keturah whom Abraham took after Sarah's death. Abraham sent his other sons eastward as it was Isaac who was to inherit the land of Canaan. Jokshan is also named as the father of Sheba and Dedan. Presumably these Semites joined the Hamitic tribes. If this is not the case Jokshan's tribes may have got their name by dwelling in the same region as the Hamites. If the first suggestion is correct, then it would seem reasonable than the tribal blending occurred while Sheba and Dedan lived in close proximity with subsequent migration of the tribe(s) apart to their new locations. Sabteca's descendants also dwelt in Arabia. In the area of modern day Yemen. So Cush was the ancestor of several tribes that dwelt in Arabia, though his other descendants, who took his name, migrated to Africa. Mizraim is unequivocally Egypt. Egypt is called Misr by its citizens. Mizraim is mentioned multiple times in the Bible. How closely the modern inhabitants are related to the ancient dynasties given the interactions of Egypt with its neighbours over the centuries would make for interesting research. The Ludim (not to be confused with the Semitic Lud) are thought to have migrated to Libya in northern Africa, east of Egypt. Note that the Ludim are descendants of Mizraim. A possible inference that they migrated from Babel to Egypt as Mizraim and a tribe broke off and shifted west. The people of Anamim are not well identified. The land of Anami was adjacent to the land of Caphtor, another descendant of Mizraim. Anami was probably located at Cyrene in the east of Libya. The Lehabim are sparsely mentioned in ancient texts. The Naphtuhim are mentioned in some Egyptian writings as dwelling in the Nile delta. The Pathrusim possibly dwelt in Upper (ie. south) Egypt. The Casluhim are little known though they are the ancestors of the Philistines. The Philistines are well documented in the Bible from the time of Abraham. They dwelt in the Gaza region in Palestine. Palestine is clearly etymologically related to Philistine. This raises the question of whether they intermingled with the Philistines (see Jeremiah 47). But based on the migration of the Caphtorim, their identity in the Targums, the location of the Anamim, the locations the other descendants of Mizraim settled in, and that they were involved in the Ethiopic War; it is almost certain they settled in north-east Africa. 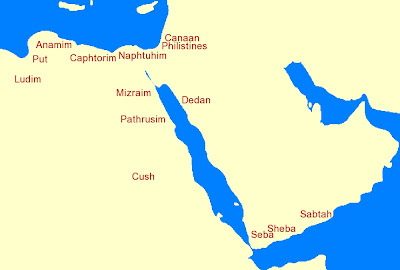 So Mizraim and his sons settled along the Nile and the southern coast of the Mediterranean. Put was probably in the area of Libya near Cyrene. Canaan was in the area of the Levant. Numbers mentions the Canaanites dwelling by the sea and next to the Jordan. Sidon dwelt adjacent to the Mediterrean. The city of Sidon was well known in Biblical times and is often mentioned in conjunction with Tyre. The Sidonians are identified as the Phoneticians. The Jebusites occupied at least Jerusalem and probably the surrounding hills. David defeated them when he conquered the city. The Amorites dwelt in the region of Canaan and were defeated by Israel during the conquest. Numbers mentions that Sihon was a king of the Amorites and he dwelt east of the Salt Sea, north of the Arnon River up to the Jabbok River. Another Amorite king, Og, was king of Bashan. His kingdom was north of Sihon's kingdom. Other Amorites dwelt in the hill country west of the Jordan. Joshua mentions 5 kings in the west: the king of Jerusalem, the king of Hebron, the king of Jarmuth, the king of Lachish, and the king of Eglon. Given that the inhabitants of Jerusalem at time of Joshua were the Jebusites, they may have dwelt there with the Amorites, or more likely, Amorite may have become a more general term for many tribes in Canaan. Cooper places the Girgashites east of the Jordan river. The Hivites dwelt under Hermon in the land of Mizpah (Numbers 21). 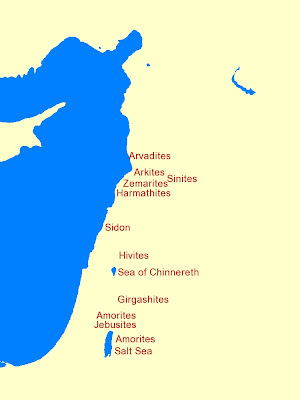 Hermon is north of the Sea of Chinnereth. The Gibeonites who made a treaty with Israel were Hivites. The Arkites dwelt in region that is currently called Akkar in Lebanon. The Sinites settled near the Arkites. The Arvadites dwelt on the island of Arwad approximately 3 km west of the Syrian Coast. The Zemarites dwelt near where the city of Tripoli, Lebanon is located. The Hamathites lived in the region that still bears their name Hamat, which is a city in the north of modern day Lebanon. This is more detailed map of the sons of Canaan, the son of Ham. Japheth is possibly the oldest of the 3 sons of Noah. The translation of Genesis 10:21 is debated though currently it is thought that the Hebrew is best translated to state that Shem is the eldest. Shem was born when Noah was 502. Noah had his 3 sons after he was 500 suggesting that Japheth may have been born when Noah was 500 and Shem 2 years later. The chronology of Noah's family is less precise than the other patriarchs (except Terah which parallels it) and therefore the data should be held more tentatively. Ham is the youngest (Genesis 9:24). Sons of Shem(1): Elam(2), Asshur(2), Arpachshad(2), Shelah(3), Eber (4), Peleg(5), Joktan(5), Almodad(6), Sheleph(6), Hazarmaveth(6), Jerah(6), Hadoram(6), Uzal(6), Diklah(6), Obal(6), Abimael(6), Sheba(6), Ophir(6), Havilah(6), Jobab(6), Lud(2), Aram(2), Uz(3), Hul(3), Gether(3), Mash(3). The Elamites are well known and mentioned several times in the Bible. The dwelt north of the Persian Gulf in the area of modern day Iran. 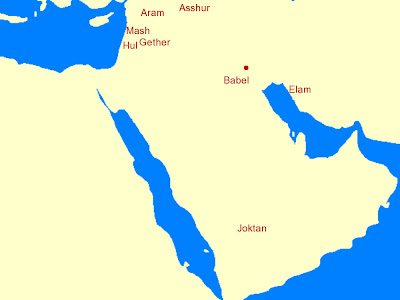 Asshur was the ancestor of the Assyrians. The capital of Assyria was Nineveh. Arpachshad is said to be the father of the Chaldeans. Chaldean history is somewhat difficult to pinpoint. It is known that they dwelt in the area of Babylonia, but some suggest that they shifted there from the north-west. Shelah is notable as the father of Eber; whether any other nation descends from him is unknown. Eber gave his name to the Hebrews though they are descended from Abraham who is several generations later. Eber's other descendants are not known by the name "Hebrew" which is essentially synonymous with Israelite. Peleg is mentioned in the ancestry of Abraham and is also noted for the events documented in his name. He is not known to be the founder on any nations. Joktan is the father of several Arab tribes along the southern and eastern border of the Arabian peninsula. Many of Joktan's 13 sons mentioned in the Table of Nations are well documented, see Appendix 1 of After the Flood. Almodad = al-Morad, location unknown. Sheleph = Salif; north of Sanaa, Yemen. Hazarmaveth dwelt around Hadramaut, Yemen. Jerah = Yarki; near Hadramaut, Yemen. Hadoram; near the Yarki. Uzal dwelt around Sanaa, Yemen. Diklah possibly near Kuwait. Obal dwelt between Hadeida and Sanaa, Yemen. Abimael dwelt in Yemen. Sheba possibly dwelt in Yemen. Ophir dwelt in Yemen. Havilah uncertain. Jobab dwelt near Mecca. Josephus claims that Lud was the ancestor of the Lydians who dwelt in the area of modern day western Turkey. However the Lydian language was Indo-European (ie. Japhetic) and Lud was Semitic so this association may be incorrect. The Arameans who descended from Aram are well documented and lived in the area of modern day Syria. Their interactions with Israel are documented thru-out Scripture. Uz is unknown currently. Job lived in Uz but whether that is the same area or nation is unclear. Descendants of Hul possibly dwelt north of the Sea of Galilee. Descendants of Gether possibly dwelt south of Damascus. Descendants of Mash possibly dwelt in the region of modern day Lebanon. So what are the nations that are mentioned in the Table of Nations? Some are clear from elsewhere in the Bible. Many are mentioned in ancient texts, Josephus gives some identifications, it may be hard to be certain for some. Several modern authors have documented the identities of these nations. Bill Cooper has summarised many ancient sources in his book After the Flood. Parts of it are probably due for review and update. He has 3 appendices identifying the descendants of the sons of Noah including others mentioned in Genesis outside chapter 10. I will limit discussion in these 3 posts to names mentioned in the Table of Nations. Sons of Japheth(1): Gomer(2), Ashkenaz(3), Riphath(3), Togarmah(3), Magog(2), Madai(2), Javan(2), Elishah(3), Tarshish(3), Kittim(3), Dodanim(3), Tubal(2), Meshech(2), Tiras(2). Bracketed numbers are the generational number. Gomer is thought by some to be the ancestor of the Cimmerians who initially lived near the Caspian Sea, though were driven out later. Josephus however identifies them with the Galatians in the area of modern day Turkey . The Galatians were the ancestors of the Gauls so if this identification is correct this gives us the source of the French. Ashkenaz is well known to refer to Germanic. The Ashkenazim are thought to be the ancestors of the Germanic peoples though they first settled in Armenia before subsequently moving westward. Riphath was the ancestor of the Paphlagonians who lived adjacent to the Black Sea. they are mentioned by Herodotus and Xenophon. The descendants of Togarmah settled in Armenia. So we can see that Gomer and his family travelled north and settled on the Caspian Sea and across Armenia to the Black Sea. Magog in Scripture seems to refer north into the region that is now Ukraine or further north into Russia, though others claim he was the ancestor (solely or with the Ashkenazim) of the Scythians. Madai was the ancestor of the Medes who lived north-west of Persia (both in modern day Iran). They became a world empire and with the Persians (who became the dominant power) conquered Babylon in the time of Daniel. Javan was the ancestor of the Greeks. Elishah was the ancester of the Aeolians, a Greek tribe who initially dwelt in the region of Thessaly, west of the Aegean Sea. The descendants of Tarshish are traditionally said to have lived in what is now Spain. I am not fully convinced of this. Tarshish is where Jonah attempted to flee to. 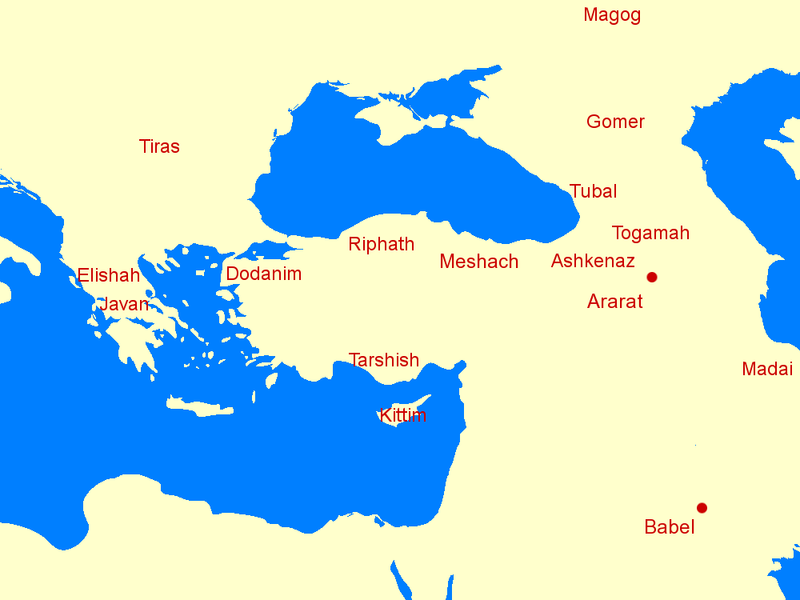 Josephus suggests Tarshish is the region of Cicilia which is part of modern day Turkey, north and north-east of Cyprus. The city of Tarsus, which appears to be etymologically related to Tarshish, is in the province of Cicilia. The Kittim dwelt on Cyprus. Dodanim is the Hebrew name for the Dardanians who settled in the Dardanelles, a small strait in East Turkey opening onto the Aegean Sea. So Javan and his sons occupied the region of Greece and Southern Turkey along the Mediterranean as well as Cyprus. This adds credence to the view that Tarshish is the region of Cicilia (South Turkey) and not Spain. Tubal's desendants were the Iberians who dwelt in the region which is now Georgia (north of Armenia). They (or some of them) subsequently migrated over the Caucasus mountains (northern border of Georgia) travelling north-east some distance into what is now Russian territory. Meshech's descendants are less certain. Some claim they were the Cappadocians (who dwelt in the region of Turkey), others Russians. Tiras was probably the ancestor of the Thracians who dwelt in a region north of the Aegean Sea and west of the Black Sea (parts of modern day Turkey, Greece, Bulgaria, Romania, Moldova). I am uncertain whether the Japhetic nations mentioned above are to be identified as these coastland peoples or whether the coastland peoples references subsequent tribes descended from them (or possibly just Javan's line). Below is a map of the earliest migrations I can identify. Note that they may not be contemporaneous. In Genesis 10 we read about the descendants of the Flood survivors. Noah and his wife, with their 3 sons Shem, Ham and Japheth, and their wives, were the sole human survivors of the global deluge. All people descend from Noah's 3 sons (though I guess it is plausible that Noah and his wife had other children following the Flood). Below are the names of Noah's descendants who were the forefathers of the subsequent tribes named after them. The list has a combination of personal names and tribal names. The tribal names are italicised. Clearly Canaan is the forefather of the Canaanites and presumably the Ludim are descendants of Lud. No specific tribes were named after Noah's sons though their names are attached to the major groupings. The Jews are Semitic (from Shem), the Europeans are Japhetic. There has been significant intermarriage between some groups, especially those who live in close proximity to each other. Excluding Noah's sons there are 70 families mentioned. It is reasonable to think the confusion of languages at Babel was along family lines. The list may not be completely exhaustive, though it may be as far as the number of generations mentioned. Madai was the father of a nation, while Gomer's sons Ashkenaz, Riphath and Togarmah are the founders of 3 nations. Ii is possible that Gomerites are a grouping of separate descendants of Gomer. Alternatively Gomerite may be a term to describe the supertribe of Ashkenazim, Riphathites and Togarmahites combined. Or possibly Gomerite could be used in either way depending on context. Some of these nations are known currently and most are referenced in history.